After last week’s inside look into our, slightly un- experienced, master plan for game convention attendance it’s time to talk about the actual gamescom 2013 experience. We took a plane to Dortmund, it was the cheapest option, and then a train to Cologne. It’s important to mention that the railway system in Germany is as close to perfect as it gets, so it’s always easy to plan the cheapest trips by combining planes and trains. The accommodation was some 30 minutes away from the convention center, but gamescom 2013 is so well organized in coordination with the city of Cologne that when a visitor buys a pass for the event he also gets free transport in Cologne for the duration of the convention. This year’s gamescom event was the biggest one yet. The official numbers put the attendance at 340.000 game fans from all around the world and over 635 exhibitors from 40 countries (us being the only, probably first ever, representatives from Macedonia) presenting around 400 titles for the first time. On the 14th of August the gates opened at 09:00 in the morning, unleashing a horde of gamers each one of them rushing to get a chance to play some new title and catch a glimpse of a blockbuster AAA announcement. The convention ground was split in ten, pretty giant, halls some of which were boosted by a second floor and all together covering around 140.000 square meters. Halls 4 and 5 were designed for the business to business meetings and the media representatives, while halls 6 through 9 were reserved for all of the major players in the game industry, namely Activision | Blizzard, Bethesda, 2K Games and EA just to name a few. These halls were massively overcrowded, obviously containing the bulk of the hundreds of thousands of visitors, and it could take as much as 2 hours just to navigate the halls in order to reach your predetermined destination. There were hour long queues formed by people eager to try out one of the new games showcased by the big developers. Just as we mentioned last week we decided to share 20 square meters with two more exhibitors in order to reduce the financial toll the event would have on our fledgling studio. So with approximately 8 square meters we really didn’t have a lot of space to work with when setting everything up, but we did put a lot of love into it 😀 All of those huge wall banners and custom cardboard cutouts and other decorations cost a ton of money, so we couldn’t really afford them. We had two banners that were placed on the two sides of the booth, a single PC to play the game on and a monitor facing outwards to show the game to all the passersby. We were located in hall 10, a smaller and slightly less significant hall compared to the ones mention above, but it still had a steady traffic of visitors and it also held one of the more significant attractions of the event in Oculus Rift. So with that in mind we still got a lot of visitors, way more than we initially expected, and got a lot of positive feedback. While we were set up in a more secluded part of the hall, and we didn’t have the needed marketing buzz to attract people to our stand we still got a decent amount of traffic. First and foremost it’s important to note that the fliers were completely unnecessary. People simply discarded them and kept wandering through the convention grounds. 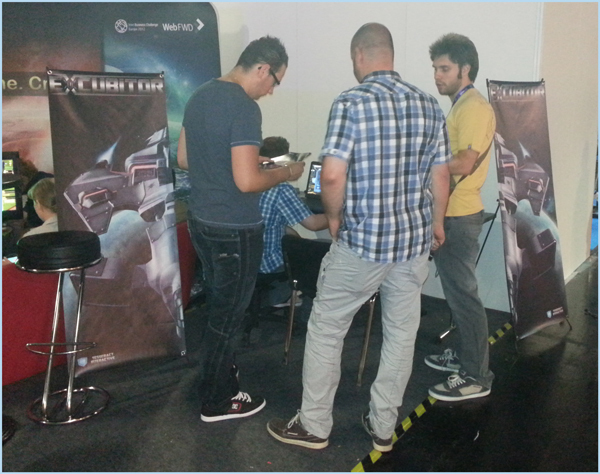 The people that came by our booth were just passing by and when they saw the game they showed interest to try it out. The fact sheets on the other hand proved to be useful, as they provided additional info about the game and a download link for the ALPHA build. The people that tried the game loved it, which is a giant boost to our morale since this is the first time we put the game out into the world for people to scrutinize. While the build was mostly stable there were some crashes and hiccups, but that’s to be expected with any alpha build. Gamers were asking when can they expect to buy the final product, asking for achievements, a multiplayer mod and all in all left the booth wanting to play more, which is something anyone showing a game for the first time hopes for. We were genuinely surprised that people elected to wait in line in order to play the game, not hours like for the AAA titles mind you, but still it meant we left a positive impression. There were approaches from publishers and advice from media people. The whole thing was almost perfect. Our lack of experience showed though. We had no clue how big this thing actually is, we went unprepared. In retrospect it might have been better to take a few PC’s more so more people can play the game at the same time. We could have sacrificed a larger chunk of the budget to get a bigger booth, larger banners and one big master banner on the wall of the booth so we can be visually distinctive and with that draw more visitors to give EXCUBITOR a try. We could also try and book press meetings earlier in order to be featured on some of the more prominent entertainment sites out there. We were really late to the show this year so we missed out on all of this additional planning and organizing, so it hurt our press exposure (there was none). This is one of the main areas, if not the main one, to address for future events. 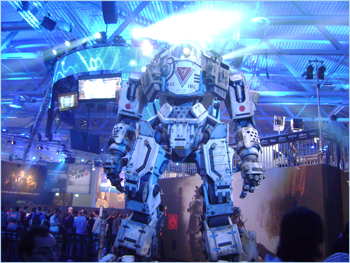 gamescom 2013 proved to be a giant success and a morale boost for the team. 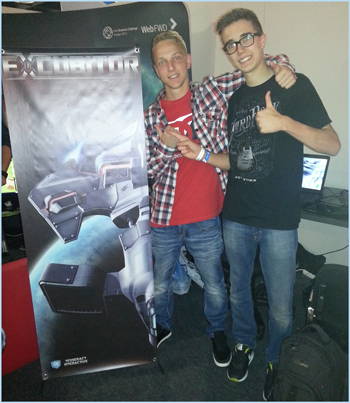 We hoped that people would like EXCUBITOR, but the feedback was overwhelmingly positive. We got tips from other indie developers, got advice from video game reporters and a bunch of contacts from publishers. Now we’ll regroup and refocus our efforts on the development of the game, we still have ways to go before the final product is released to the public. The things we learned at gamescom 2013 and the feedback we received will in some way shape and guide our development from this point on. It was a huge step for us to take and we can’t be happier for it. Hopefully next time we’ll be more prepared and iron out the few things we saw as organizational faults, but knowing that this was the first time we visited a convention, that we had no help and guidance from people in the industry it’s safe to say that it couldn’t have been any better.